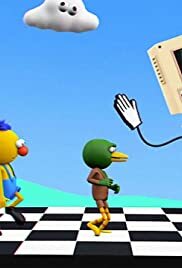 In this 4th installment, the puppets encounter a crazed computer named Colin, who uses singing and dancing to teach the puppets about technology and the Internet, although things soon turn too digital. The two remaining puppets learn about eating healthy, but things go awry when they receive a mysterious phone call. Our protagonists are waiting for a show to come on. It would have been no trouble if an annoying clock had not decided to chime in. All alone, Yellow Guy tries to stop a lamp from teaching him about dreams. While Red Guy finds out the truth about the puppet's existence. A singing notebook teaches three puppets how to be creative. The surreal life of Salad Fingers, an unknown creature living in an apocalyptic wasteland. A 2 minute sketch comedy show created by Tomska. A 2 minute sketch comedy show made by Tomska. A sketch comedy show created by Tomska. A series of crude cartoon shorts that center around comedy. These shorts of which usually have irony and/or someone's reaction as the joke. This is the creators' site. Crew member: I'll paint a picture of a clown. My dad is a computer. You are not invited to the party. This is not my favorite one. This is really too weird for me.